It’s summertime in Ohio and the season for sunshine, swimming pools and family gatherings is upon us. That means perfect weather for grilling out! And if you’re looking for a place to pick up fresh, local meat to throw on the grill and fresh seasonal fruits and vegetables to pair it with, look no further than Blystone Farm in Canal Winchester. Blystone Farm is a historic, four generation family farm that has taken eating local to a whole new level. Herds of commercial sheep have been raised on the farm through the years. Then, eleven years ago, Joe Blystone had a brainstorm. Seeing opportunity in Franklin County and surrounding areas, Blystone led the charge in opening an on-farm meat processing facility. Opportunities for expansion accompanied the operation’s success. The family farm took on pigs and cows and began laying plans for expanding the shop. Joe’s wife Jane was welcomed into the family business in 2010, bringing expertise as a baker and experience as a business owner. The building was expanded and the Blystone Farm Retail Market was developed into what it is today – a one stop shop for fresh, local meats, fresh baked bread and pastries, local seasonal fruits and vegetables, craft beer and more, including locally made condiments such as Blystone Farm branded sauces and seasonings. Nearly all of the meat available at the shop is processed on-site from all Ohio raised livestock. The only exception is grass-fed, naturally-raised buffalo meat used in their bison burgers, sent straight from The Wild Idea Buffalo Company in South Dakota. It doesn’t stop at the butcher shop and bakery though. Customers with special occasions can place custom orders including half and whole animals for events like a hog roast. In fact, custom orders are gladly accepted and prepared for customers with specific needs. And, as an added bonus, the outdoor table seating and in-house deli at the shop offer visitors a chance to sit, relax and have a sandwich at lunch while overlooking the beauty of rural farmland. Word has begun to spread about quality products and service in the expanded shop and rave reviews are rampant on social media. “We’re starting to see folks stop in from further out than Lancaster, Fairfield County, and Franklin County” which is what the primary customer base was in the past, Joe explained. 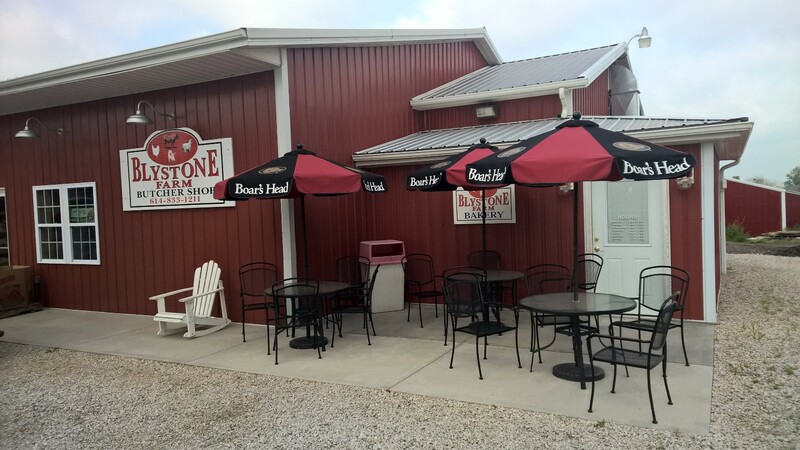 So the next time you have a hankering for a bison burger or a fresh baked pie, you’re planning a hog roast, or you feel like impressing your guests with local brewed craft beer and a porterhouse steak, stop by Blystone Farm in Canal Winchester. At Blystone Farm, it’s always the season for quality food and drink! Want to know more? Visit their website or follow Blystone Farm on Facebook!